35mm viewfinder camera produced by Lomo from 1970 to 1995. Lens Triplet-43 40mm 1:4. Fully manual either by full user setting or by fixing film speed (and therefore aperture) with shutter speed adjusted for light by matching weather symbol. 1/15-1250 +B. Shutter needs cocking witch switch on lens before firing. 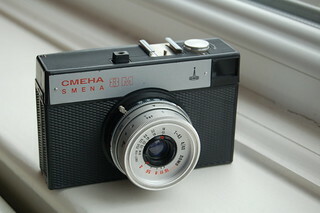 Evolved from smena 8.